Whistle Down The Wind is a wonderful musical play for all ages. There is cool scenery and effects. The cast was very talented. There were a lot of children and the rest were adults. They all sang very powerfully and well. The music was written by Andrew Lloyd Webber. The story takes place in Louisiana around Christmas 1959. It is about children who have faith. There are three kids: Brat, Swallow and Poor Baby. They have just rescued kittens, that were going to drowning in a lake, and go to put them in the barn. 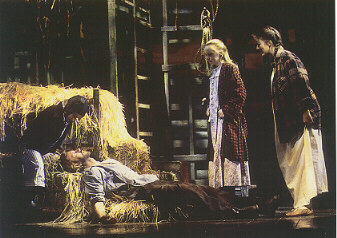 When they get there a man is laying on a haystack covered in hay. Swallow accidentally sits on him and the man gets up. "Who are you?" Swallow yells. The man looks at the kids and falls back, saying "Jesus Christ." Swallow runs away to tell the children that Jesus has returned and is in her barn. The children go to meet him. They are so certain the man is Jesus because he has blood on his hands and feet. He tells the kids not to tell anyone he is there. The man lied to the kids and told them he was Jesus. Swallow loved him so much. She asks the man if he could bring her mother back to life. Swallow is sad when he can't do it. I liked the part when the man came out to see the kids, he made a peace sign and all the kids looked at him like he was crazy. Meanwhile, the police and the adults were looking for a criminal who escaped from a prison. The kids knew the man couldn't be him. Swallow tells an older boy named Amos about the man. Amos likes Swallow. He tells the police about the man for Swallow's protection. When the police come to the barn, Swallow and the man are there. When he sees the police, he confesses to Swallow that he is not Jesus and pushes her out of the barn. Even though the man told Swallow that he was not Jesus she still didn't believe him. She had faith in him. The police shoot a flare in the air to see if the man escapes, and it sets the barn on fire and kills him. Overall, the play was very well done and the music was terrific.